Forty-two degrees when I get up and the sun has just risen, casting sunlight through the trees in long skinny patches. 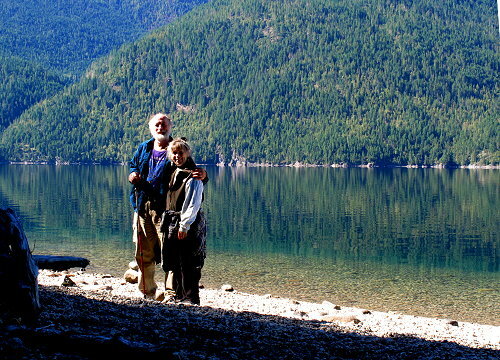 Today, after breakfast, we head to the Galena Trailhead near the path from Rosebery to Slocan Lake. The Galena Trail is the old N & S Railway bed, so it is a mostly level and easy hike. 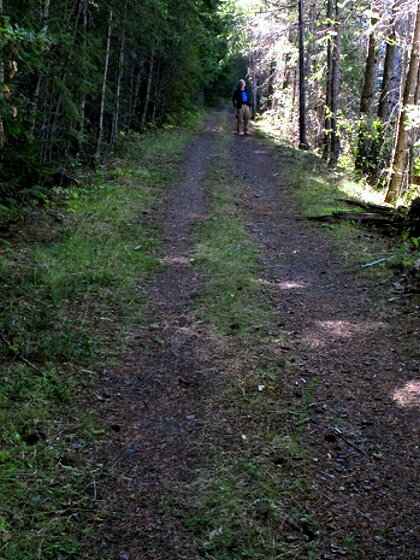 A portion of this trail heads east and then south along Slocan Lake to New Denver, and that is where we will walk today. After parking at the trailhead parking space, we get our cameras and hiking sticks, and are soon ready to go. We first traverse a cedar forest, rather dark and spooky. 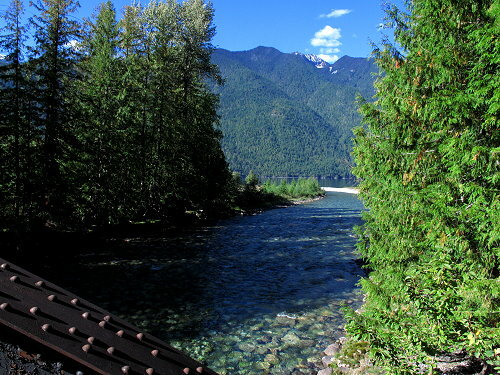 As we emerge from the cedar forest, we cross Wilson Creek on an old railroad bridge near its confluence with Slocan Lake. When the view opens up, we can see the lake and what appears to be the remains of a once commercial pier. 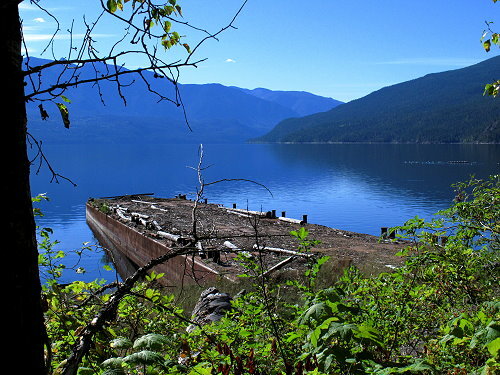 Slocan Lake and the railroad were instrumental in the moving of silver, lead, and zinc ore from the mines to freight steamers in the 1890’s. Past the pier, the trail bends to the south and is a straight shot along the lake most of the way to New Denver. A great variety of trees on either side create a canopy over the trail. Looking west, the lake can be seen in glimpses through the dense trees, while the other side of the trail slopes steeply upward toward the highway, also obscured by trees, where we can hear occasional traffic. Another mile and we find a pathway down to the rocky gravelly beach. 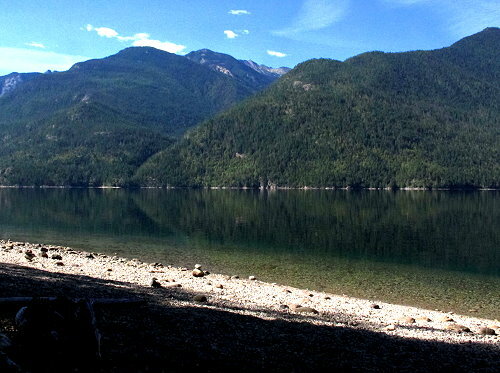 We sit on a sun-bleached log to share a trail bar and admire the view of the lake with the mountains of Valhalla Provincial Park across from us. It is so pleasant here, we are reluctant to head back, but other activities beckon. Along the way we stop to watch and try to take photos of a woodpecker that is busily throbbing away on a log not far off the trail. Amazing how fast a woodpecker’s head can move. On we go, stopping occasionally for a few more photos. 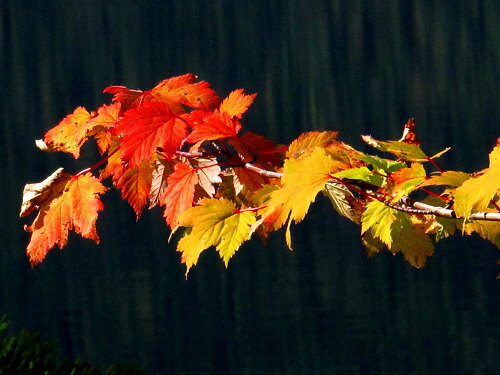 I am especially enjoying the first colors of autumn. 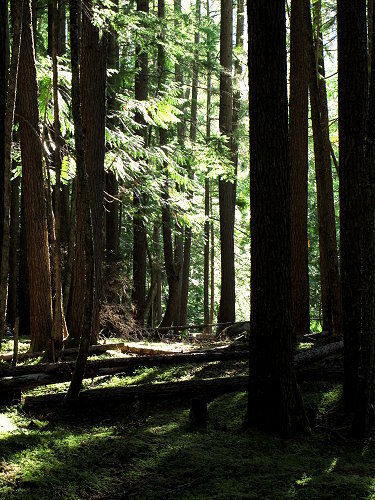 When we are in the midst of the dark cedar forest, a sound and movement catches my attention. Clifford has already seen the bear cubs, but does not said anything until one of them takes off in the direction we are headed. My inclination is to head straight the other direction to the lake shore, walk along the beach, and take the much more traveled pathway from the lake up to the Galena Trailhead. However, Clifford keeps us steady on the trail and the young bear ahead of us soon gallops back to his sibling deep in the woods. We are soon at the trail head and I am glad that we don’t have to walk all the way back to camp from here, as I am tired out from this easy two-and-a-half mile hike. It is a concern to me that my endurance has declined so much this past year. Back at camp I take a shower, clean out the coolers, then enjoy a cup of coffee as I write in my journal, moving my chair from one patch of sun to the next as each disappears into tree shadows. Before the last sun-patch goes away, I get out the flute and play for a bit. A campfire extends my time outside and I peel potatoes for dinner by firelight, not wanting to waste any of the heat being generated. Categories: Pony Camping, Quiet Walk PhotographyTags: Autumn, British Columbia, Camping, Canada, hiking, Nature, Pop-up, Quiet Walk Photography, quietwalkphotography.com.